Introduction: Acute otitis externa (AOE) is the inflammation of the external ear. It usually presents with severe pain in the ear. The treatment of AOE should aim in relieving pain at the earliest. Out of the various treatment options, topical treatment should be considered as prescribing oral antibiotics without local treatment can cause antibiotic abuse. Due to unavailability, cost, and compliance issues of other topical measures, we observed and proved the effectiveness of a new modality glycerine and povidone-iodine wick in the treatment of AOE. Objectives: The objective of this study is to study the efficacy of new modality treatment-glycerine and povidone-iodine wick for AOE. Materials and Methods: Three hundred and forty-seven cases with AOE due to exclusive bacterial infection were included in the study. Otitis externa was graded as per Brighton grading scheme. Pain score was assessed using Wong and Baker pain assessment scale. Patients were treated by performing a thorough aural toilet, keeping a glycerine and povidone iodine wick in the EAC and prescribing a nonsteroidal anti-inflammatory drug. Few severe cases were administered the systemic antibiotic. Score of pain, canal edema, and the presence of ear fullness on D1, D3 (48 h later), and D5 was noted. Further assessment and repacking with a fresh wick was done if required until the pain and edema subsides completely. Results: It was seen that canal edema and tragal tenderness subsided significantly (P < 0.001) on follow-up visits. The severity of pain scale on D1 decreased significantly (P ≤ 0.001) on D3. On D3 or the first follow-up visit, 68 (19.5%) of patients required repacking, whereas there was no need for repacking on D5, i.e., second follow-up visit. Average duration of the clinical resolution was 3 days. Conclusions: The treatment method was readily available, easy to perform, cost-effective and had a better patient compliance. Povidone-iodine scores with no proven microbial resistance until date. To enhance delivery of drug locally specialist ear cleaning followed by wick insertion should be done. Use of glycerine and povidone-iodine ear pack is definitely effective with the good clinical outcome by 3 days maximum duration is 7 days. Use of oral antibiotics only for selected cases along with topical treatment for otitis externa is advisable. The outcome regarding pain relief and edema reduction were analyzed with satisfactory outcome at the earliest. Acute otitis externa (AOE) is defined as inflammation of the external ear. A hallmark sign is tenderness of tragus, pinna, or both. There is cellulitis of ear canal skin and subdermis with acute inflammation and variable edema. The most common pathogens are Staphylococcus aureus and Pseudomonas aeruginosa. Prescribing oral antibiotics without local treatment can cause antibiotic abuse which may lead to resistant organisms. The etiology of AOE is multifactorial and is seen more in warmer climates with increase in humidity. Bacterial, fungal infections, local trauma by self-cleansing, irrigation, wearing hearing aids contribute to AOE. Debris or chronic discharge from chronic suppurative otitis media (CSOM), dermatological conditions, cerumen accumulation, and foreign body, are few other causes. The purpose of this study is to observe the effectiveness of treatment for relieving pain and edema by using a new modality of treatment glycerine and povidone-iodine wick with satisfactory outcome at the earliest. An interventional study was carried out on 448 cases of AOE from August 2016 to July 2017. Out of these 101 patients were found to have underlying disease with AOE such as CSOM, ASOM, Otomycosis, Wax, Foreign body, Granular myringitis, etc. These were excluded and only cases with AOE due to exclusive bacterial infection were included in the study. Proposal was approved by the Research and Ethics Committee of our Hospital reference no. IEC/07 and prior informed written consent was obtained from the patient before treatment and for clinical photos. In severe cases along with the above line of management start the patient on systemic oral antibiotics. Otitis externa was graded as per Brighton grading scheme. Pain score was assessed by using Wong and Baker pain assessment scale. Score of pain, canal edema, the presence of ear fullness on D1 was noted. Subsequently the patients were called for reassessment 48 h later that is D3 or the first follow-up visit. Next follow-up was again 48 h later that is D5 or second follow-up visit. Further assessment and repacking with a fresh wick was done if required till the pain and edema subsides completely. McNemar's test was used to compare canal edema pre- and post-treatment results: Day 1 versus Day 3, Day 1 versus Day 5 and pain score on D1, D3, and D5 was compared by using Wilcoxon signed rank test. A P < 0.001 was considered to be statistically significant. Clinical resolution of AOE with pain relief was the main objective. Duration for resolution was noted. Patients were also counseled regarding a few common preventive measures to avoid AOE. Based on history and examination, 347 patients with AOE were included in the study. 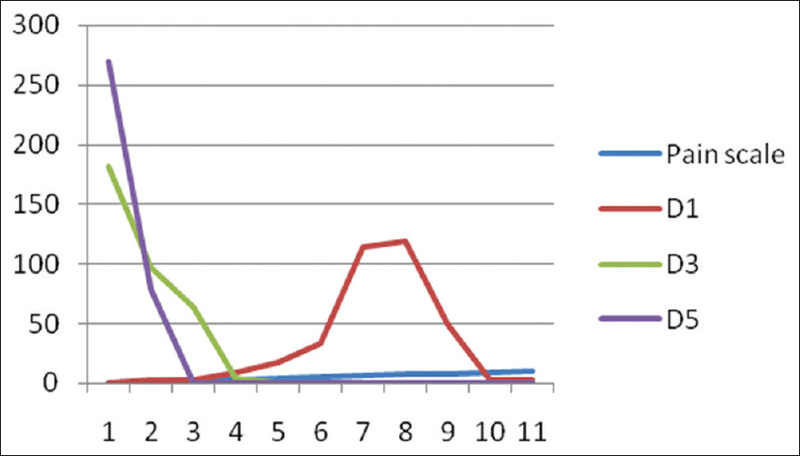 Sociodemographic profile and distribution of cases are given in [Table 1]. Otitis externa was graded as per Brighton grading scheme. It was found that 175 (50.4%) of them had Grade I–II otitis externa, 168 (48.4%) Grade III and 4 patients presented with Grade IV. Only 4 (1.1%) with Grade IV otitis externa and few 30 (8%) of patients with III or less grade but with risk factors including diabetes mellitus and impaired host defenses (severe OE) were given systemic oral antibiotics along with topical treatment with glycerine povidone-iodine wick. Assessment of severity of pain was done using Wong and Baker pain assessment scale. Pain score on D1, D3, and D5 was compared by using Wilcoxon signed rank test. It was found that the severity of pain scale on D1 decreased significantly (P ≤ 0.001) on D3. 97% of patients presented with much severe pain on D1 which had completely resolved on D3; with only 18.4% of patients left with mild pain and few with just noticeable pain. On D3 or first follow-up visit 68 (19.5%) of patients required repacking, whereas there was no need for repacking on D5, i.e., second follow-up visit. 78 (22.4%) of them had only noticeable pain on D5, but their symptoms completely subsided by a week time. Even the patients with severe otitis externa were able to resume normal activities by D3. Canal edema was present in all patients on D1. McNemar's test was used to compare pre- and post-treatment results Day 1 versus Day 3, Day 1 versus Day 5. It was seen that canal edema and tragal tenderness subsided significantly (P ≤ 0.001) on follow-up visits. Furthermore, a significant improvement was seen regarding improvement in ear fullness also. Details of observation and clinical images are shown in [Table 2] and [Figure 1], [Figure 2], [Figure 3]. The average duration of the clinical resolution was 3 days. Anything which can cause disruption of the epithelium of ear canal can permit invasion of bacteria. Various predisposing factors were identified like humidity, prolonged exposure to water, seborrheic dermatitis, psoriasis, wax removal, foreign body, otorrhea caused by middle ear disease and trauma to the ear canal by self-cleansing. A rapid and correct diagnosis is essential for management. Furthermore, the presence of other diseases which seriously affects the outcome of AOE should be searched. Key components may include patients with diabetes mellitus, otomycosis, tympanostomy tubes, perforated tympanic membranes. Presence of some other disorders with AOE is important as they may require systemic antimicrobials or may require the use of topical antifungal agents. Ichthammol (ammonium bituminosulfonate) is a product of natural origin which is viscous, water-soluble and has bitumen like odor. Icthammol's dermatological action was promoted by German physician. It is thick brown liquid soluble in water and miscible with glycerine. It has anti-inflammatory, bactericidal, and fungicidal properties. Used as a 10% or 20% concentration it is effective against Gram-positive organisms. A mixture of glycerol and ichthammol is used for the topical treatment of ear infections. Glycerine is a humectant which is used in topical dosage forms to increase the solubility of a chemical compound's active ingredients, increasing the active ingredients ability to penetrate skin, or its activity time. Dehydration would lead to decrease in water activity on upper side (stratum corneum) of skin membrane which decreases skin permeability. 10% glycerol maintains physical properties of skin and maintains hydrated lipid system. It increases permeability properties and increases transdermal drug delivery. 5% povidone-iodine has a broad spectrum efficacy against wide range of bacteria including S. aureus, P. aeruginosa and Enterococcus strains also fungi, protozoa and viruses. It not only destroys a wide range of bacteria but also inactivates and inhibits the release of bacterial exotoxins. It rapidly penetrates into microorganisms and acts by destroying microbial protein and DNA. Povidone-iodine can reach the biofilm and has been shown to cause the outer layers of the biomass to slough out. Other advantages of 5% povidone-iodine include: (1) Cheaper than topical antibiotics, (2) lack of identifiable bacterial resistance, (3) not inhibited by saline or water solutions, and (4) easily available. Meticulous cleaning of the debris or discharge should be done by mopping or suctioning. A systematic review was conducted by Hajioff and MacKeith on otitis externa in which they re-evaluated the evidence to demonstrate the benefit of specialist aural toilet use from “unknown effectiveness” to “likely to be beneficial.” Physical removal of debris, infected desquamated skin helps topical medication to reach the underlying infected and inflamed ear canal skin. Furthermore, it helps to visualize tympanic membrane and differentiate AOE from other diseases. We believe that specialist ear cleaning is definitely beneficial and improves patient satisfaction also. As the canal edema distracts the periosteal lining of the bony canal, there is an extreme amount of pain. Insertion of wick helps mechanically by splinting action pressing the soft tissues laterally, opening up the lumen and application of topical medication. Topical medications are unable to penetrate an edematous canal wall which can be achieved by insertion of a wick. Hence, insertion of a wick is a better topical treatment for otitis externa than instilling ear drops. Various studies have demonstrated the benefit of ear packing in otitis externa. The statistically significant decrease in pain score was observed regarding pain relief, canal wall edema or aural discharge with Ichthammol glycerine pack and antibiotic steroid drops. Ichthammol glycerine pack had advantage over antibiotic steroid drops in terms of patient compliance. Furthermore, Masood et al. recommended glycerol ichthammol dressing as an initial treatment of severe otitis externa on the basis of cost, avoidance of resistance and toxicity. As insertion of a wick is a better topical treatment for otitis externa, we tried used glycerine with povidone-iodine wick. Both glycerine and povidone-iodine are easily available at all the clinics. These packs can be prepared fresh before insertion and provide good, satisfactory outcome at the earliest. Patient compliance was good, it is cost-effective, and no evidence of resistance or toxicity was noted. 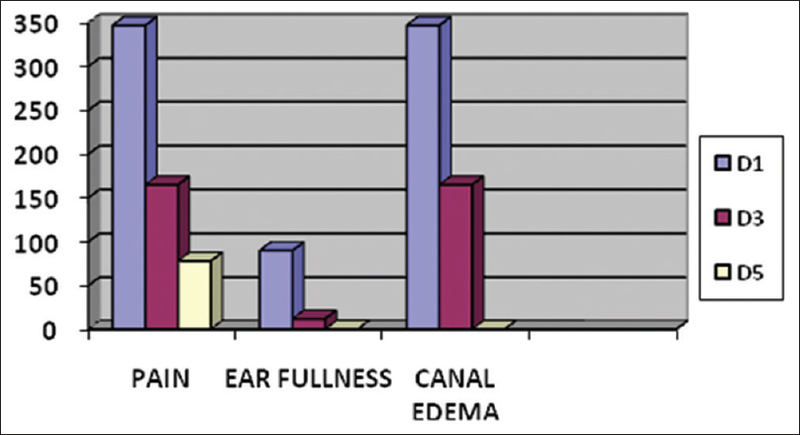 The pain score and severity of canal edema improved significantly post treatment. Patient outcome in terms of duration of symptoms was studied by van Balen et al. They concluded that overall cure rates at 7, 14, and 21 days were 38%, 68%, and 75%, respectively. The symptoms lasted for a median period of 6–7 days. Complete reduction in edema and pain with steroid antibiotic pack was observed on the fifth visit. In our study, it was found that severity of pain scale on D1 decreased significantly (P ≤ 0.001) on D3. 97% of patients presented with much severe pain on D1 which had completely resolved on D3; with only 18.4% of patients left with mild pain and few with just noticeable pain. Canal edema and tragal tenderness subsided significantly (P < 0.001) on follow-up visits. The average duration of the clinical resolution was 3 days. As such topical antimicrobials are effective in AOE. It is also seen that oral or systemic antimicrobials have a limited utility. Topical treatment is recommended because of their safety, efficacy over placebo in randomized trials and excellent clinical and bacteriologic outcomes in comparative study. Patients when randomized to topical ointment plus oral antibiotic versus topical ointment plus placebo showed no difference in cure rates. Systemic antibiotics, if indicated, for example, Grade IV otitis externa, diabetes mellitus, patients with immunocompromised status should include coverage for common AOE pathogens including P. aeruginosa and S. aureus. Resisting use of oral antibiotics is important because of increase in the incidence of resistant organisms. Bacterial resistance is less likely with topical antimicrobials because of the high local concentration of drug in the ear canal. AOE can present as a localized form (furunculosis) or a diffuse form. Sometimes, it may be difficult to distinguish it from simple but severe otitis externa. Incision and drainage in furunculosis are advised only when an abscess has formed. Use of topical/systemic antibiotics still remains the basic line of treatment for AOE. Topical treatment with wick enhances drug delivery locally and reduces canal edema. Use of systemic antibiotics should be reserved for severe otitis along with topical treatment. Patients should also be prescribed appropriate analgesics to permit patients to achieve comfort, rest and resume normal activities. Use of nonsteroidal anti-inflammatory drugs in the initial phase was sufficient in achieving satisfactory clinical outcome. It was observed that in most of the cases of otitis externa the cause was ear manipulation. Patients were counseled regarding safe habits to prevent otitis externa up to some extent. They were advised to not to clean the ears hard with buds and avoid local trauma by self-cleansing, dry the ear properly after bath or swimming. Use of oral antibiotics only for selected cases but along with topical treatment for otitis externa. Mahmood A. Sensitivity and spectrum of bacterial isolates in infectious otitis externa. J Coll Physicians Surg Pak 2004;14:580-1. Levy SB. The Antibiotic Paradox: How the Misuse of Antibiotic Destroys their Curative Powers. Cambridge, MA: Perseus Publishing; 2002. Blake P, Matthews R, Hornibrook J. When not to syringe an ear. N Z Med J 1998;111:422-4. Brook I, Coolbaugh JC. Changes in the bacterial flora of the external ear canal from the wearing of occlusive equipment. Laryngoscope 1984;94:963-5. Yelland M. Otitis externa in general practice. Med J Aust 1992;156:325-6, 330. Wong DL, Baker CM. Smiling faces as anchor for pain intensity scales. Pain 2001;89:295-300. Lindisfarne ME, Berwick J, Das P. Clinical Review: Acute Otitis Externa. Available from: https://www.gponline.com [Last accessed on 2016 Jul 18]. Gayko G, Cholcha W, Kietzmann M. Anti-inflammatory, antibacterial and antimycotic effects of dark sulfonated shale oil (ichthammol). Berl Munch Tierarztl Wochenschr 2000;113:368-73. Masood A, Moumoulidis I, Ray S, Chawla O, Panesar J. A randomised controlled trial comparing triadcortyl with 10% glycerine-ichthammol in the initial treatment of severe acute otitis externa. Eur Arch Otorhinolaryngol 2008;265:881-5. Björklund S, Engblom J, Thuresson K, Sparr E. A water gradient can be used to regulate drug transport across skin. J Control Release 2010;143:191-200. Björklund S, Engblom J, Thuresson K, Sparr E. Glycerol and urea can be used to increase skin permeability in reduced hydration conditions. Eur J Pharm Sci 2013;50:638-45. König B, Reimer K, Fleischer W, König W. Effects of betaisodona on parameters of host defense. Dermatology 1997;195 Suppl 2:42-8. Chang SL. Modern concept of disinfection. J Sanit Eng Div Proc 1971;97:689-707. Brown ML, Aldrich HC, Gauthier JJ. Relationship between glycocalyx and povidone-iodine resistance in Pseudomonas aeruginosa (ATCC 27853) biofilms. Appl Environ Microbiol 1995;61:187-93. Lachapelle JM, Castel O, Casado AF, Leroy B, Micali G, Tennstedt D. Antiseptics in the era of bacterial resistance: A focus on povidone iodine. Clin Pract 2013;10:579-92. Hajioff D, MacKeith S. Otitis externa. BMJ Clin Evid 2015;2015. pii: 0510. Linstrom JC, Lucento EF. Infections of the external ear. In: Bailey BJ, Johnson's JT, editors. Head and neck surgery-Otolaryngology. 4th ed., Vol 1. Philadelphia: Lippincott Williams and Wilkins; 2006.p.1989-90. Ruckenstein MJ. Infections of the external ear. In: Cummings CW, Haughey BH, Thomas JR. eds. Otolaryngology: Head and neck surgery. 4th ed., Vol. 3. Philadelphia: Elsevier Mosby; 2005. p. 2979-87. Hilton MP. Furunculosis In: Gleeson MJ, Clarke RW. eds. Scott-Brown's Otorhinolaryngology head and neck surgery. 7th ed., Vol. 3, London: Edward Arnold Publications; 2008. p.3323-25. Hornigold R, Gillett D, Kiverniti E, Harries M. The management of otitis externa: A randomised controlled trial of a glycerol and icthammol ribbon gauze versus topical antibiotic and steroid drops. Eur Arch Otorhinolaryngol 2008;265:1199-203.
van Balen FA, Smit WM, Zuithoff NP, Verheij TJ. Clinical efficacy of three common treatments in acute otitis externa in primary care: Randomised controlled trial. BMJ 2003;327:1201-5. Shreshtha BL, Shreshtha I, Amataya RC, Dhakal A. A comparison of steroid antibiotic versus 10% icthammol glycerine pack. Indian J Otolaryngol Head Neck Surg 2010;62:350-3. Rosenfeld RM, Schwartz SR, Cannon CR, Roland PS, Simon GR, Kumar KA, et al. Clinical practice guideline: Acute otitis externa. Otolaryngol Head Neck Surg 2014;150:S1-S24. Pottumarthy S, Fritsche TR, Sader HS, Stilwell MG, Jones RN. Susceptibility patterns of Streptococcus pneumoniae isolates in North America (2002-2003): Contemporary in vitro activities of amoxicillin/clavulanate and 15 other antimicrobial agents. Int J Antimicrob Agents 2005;25:282-9. Walshe P, Rowley H, Timon C. A worrying development in the microbiology of otitis externa. Clin Otolaryngol Allied Sci 2001;26:218-20.